The American Bandogge Mastiff originated in Europe and was utilized first by British gamekeepers. In addition to being used as a patrol companion, the American Bandogge Mastiff would also retrieve wounded game and patrol alone at night looking for armed poachers. It is believed that the Bandogge got its name due to being kept on a chain during the day, then let off at night to patrol. The American Bandogge Mastiff is not a purebred or even mixed breed in the typical sense. 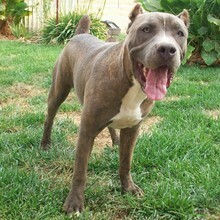 This breed can be created by crossing any Bulldog breed with any Mastiff breed. The most common crosses are the American Pit Bull Terrier and the Neapolitan Mastiff and the American Bulldog and the Mastiff. Due to this, there is no finite breed standard for the American Bandogge Mastiff. While there are many breeders who are working towards a specific goal in creating quality working lines of the breed, there are also those who work with no specific goals at all. It is recommended that you do extensive research into what you expect from your American Bandogge Mastiff, and what specific cross you would prefer. As well as researching the breeders involved to ensure what the goals for the breed and the testing as well as the pedigree of their breeding stock are. The male American Bandogge Mastiff will typically reach heights of 25-29 inches and an average weight of 100-140 pounds. The female American Bandogge Mastiff is typically smaller in stature than than male, being slightly shorter and reaching an average weight of at least 85 pounds. The coat of the American Bandogge Mastiff should be fine as well as short and close to the body. The color of the American Bandogge Mastiff comes in many varieties. These include, black, blue, fawn, red and brindle. Any of these listed colors may exhibit white markings, however, predominantly or entirely white dogs are discouraged. In spite of the American Bandogge Mastiff's menacing stature, they are revered as docile, loving family companions. The American Bandogge Mastiff's protective nature and disinterest in proving rank make them trustworthy with children. Your American Bandogge Mastiff will likely even designate themselves the family babysitter, ensuring the safety of the children in the home. While this gentle giant is docile in his down time, he is just as eager to work and play. The American Bandogge Mastiff is an intelligent and strong willed breed. They require a strong, confident leader that never relinquishes their command. This breed is not recommended for the first-time dog owner. The American Bandogge Mastiff can transition from companion to protector with an extreme quickness that may not always be anticipated by the unfamiliar owner. The ideal owner of an American Bandogge Mastiff will be well versed in canine instinct and communication. In spite of the American Bandogge Mastiff's menacing stature, they are revered as docile, loving family companions. The American Bandogge Mastiff's protective nature and disinterest in proving rank make them trustworthy with children. Your American Bandogge Mastiff will likely even designate themselves the family babysitter, ensuring the safety of the children in the home. While this gentle giant is docile in his down time, he is just as eager to work and play. The American Bandogge Mastiff is an intelligent and strong willed breed. They require a strong, confident leader that never relinquishes their command. This breed is not recommended for the first-time dog owner. The American Bandogge Mastiff can transition from companion to protector with an extreme quickness that may not always be anticipated by the unfamiliar owner. The ideal owner of an American Bandogge Mastiff will be well versed in canine instinct and communication. The American Bandogge Mastiff's natural instincts make them excellent candidates for protection work. They will not bark prior to attacking, making them experts in the element of surprise. The American Bandogge Mastiff will not be openly aggressive with strangers unless they feel there is a threat. This breed has an uncanny ability to discern common human behavior from suspicious behavior, preventing unnecessary aggression. If well socialized, the American Bandogge Mastiff will get along well with other pets, including dogs, cats and other small animals. However, failure to socialize your American Bandogge Mastiff may result in unwanted dog aggression. The American Bandogge Mastiff is an extremely loving breed with their family, and thrives on their attention. However, failure to give your American Bandogge Mastiff adequate attention and exercise will upset him and likely cause destructive behavior when left alone. You can find American Bandogge Mastiff puppies priced from $300 USD to $800 USD with one of our credible breeders. Browse through our breeder's listings and find your perfect puppy at the perfect price. The American Bandogge Mastiff's natural instincts make them excellent candidates for protection work. They will not bark prior to attacking, making them experts in the element of surprise. The American Bandogge Mastiff will not be openly aggressive with strangers unless they feel there is a threat. This breed has an uncanny ability to discern common human behavior from suspicious behavior, preventing unnecessary aggression. If well socialized, the American Bandogge Mastiff will get along well with other pets, including dogs, cats and other small animals. However, failure to socialize your American Bandogge Mastiff may result in unwanted dog aggression. The American Bandogge Mastiff is an extremely loving breed with their family, and thrives on their attention. However, failure to give your American Bandogge Mastiff adequate attention and exercise will upset him and likely cause destructive behavior when left alone. The American Bandogge Mastiff can do well living in an apartment as long as they receive adequate exercise. They require only a small area to run, and are fairly inactive when indoors. Grooming your American Bandogge Mastiff is a relatively easy affair. This breed has a fine short coat that requires only regular brushing with a rubber or a firm bristle brush to remove dead hair and dandruff. Be sure to check your dogs eyes and ears regularly to ensure they are kept clean and free of infection. Frequent bathing is unnecessary for the American Bandogge Mastiff, as this can be harmful to their skin. A once a month bath is really all the breed requires. The American Bandogge Mastiff is an intelligent breed that is eager to please making them relatively easy to train. However, a strong, commanding pack leader is necessary. This breed becomes quite large and you do not want him to believe he's running the show. Only a moderate amount of exercise is required for the American Bandogge Mastiff. A mere 45 minutes per day will keep him happy and well rounded. The American Bandogge Mastiff, if not given enough exercise regularly, will become lazy as well as difficult to deal with and even destructive. American Bandogge Mastiff Puppies for Sale - Shipped Worldwide! Finding the right American Bandogge Mastiff puppy can be dog gone hard work. PuppyFind® provides a convenient and efficient means of selecting and purchasing the perfect American Bandogge Mastiff puppy (or American Bandogge Mastiff puppies) from the comfort of your home, 24 hours a day, 7 days a week. Take advantage of our PuppySearch or leisurely browse our directory of hundreds of dog breeds, American Bandogge Mastiff dog breeders, American Bandogge Mastiff dogs for adoption, and American Bandogge Mastiff puppy for sale listings with photos and detailed descriptions. Some American Bandogge Mastiff puppies for sale may be shipped Worldwide and include crate and veterinarian checkup. Many American Bandogge Mastiff dog breeders with puppies for sale also offer a health guarantee. With thousands of American Bandogge Mastiff puppies for sale and hundreds of American Bandogge Mastiff dog breeders, you're sure to find the perfect American Bandogge Mastiff puppy.